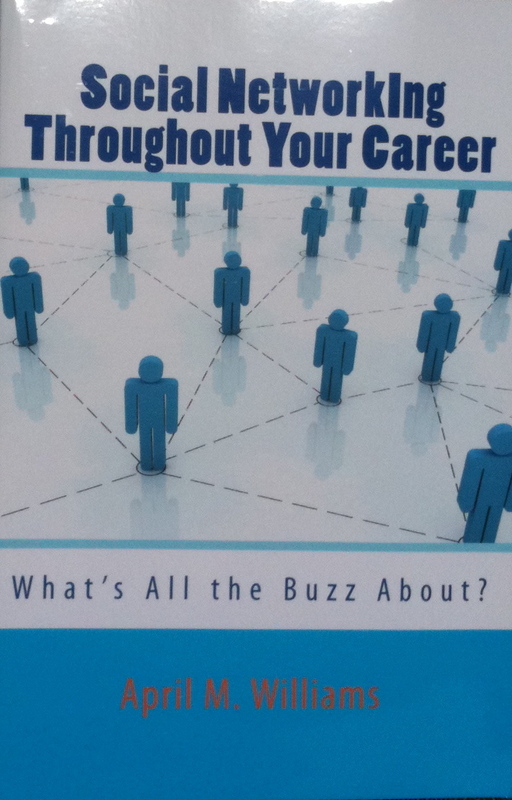 FREE Chapter (PFD) Social Networking Throughout Your Career: What’s All the Buzz About? After hearing these questions from my clients, I had to write this book, Social Networking Throughout Your Career: What’s All the Buzz About? I go way beyond the basics in this easy read. My goal is to answer your deeper, more specific questions. Click on the book image to download your FREE chapter of Social Networking Throughout Your Career book by April M. Williams. Keith Warrick says: This is an excellent primer on just how social networking tools have emerged as the primary go-to resources for finding job candidates and how one needs to effectively leverage and marshall them in order to attain professional/career aspirations. April does an excellent job outlining how all of them – Linkedin, FaceBook, Twitter, etc – have their place and value and offers excellent suggestions on just what one needs to do in order to stay on top of them. It’s all about developing an effective strategy and staying with it throughout one’s career not just when one is unemployed. Too many of us stop networking once we land a job thinking that it is no longer necessary. You’re wrong and this book tells you why. There are some valuable lessons here for anyone that does not think that having a positive social media presence is important in these times – it is mission critical. This book is an excellent reference that you can refer back to time and time again. Suzanne Kauss “MY SPECIAL ASSISTANT” says: If you snooze on reading Social Networking you might as well keep snoozing! My title of this review is EXACTLY what I got from April’s book entitled “Social Networking Throughout Your Career”…..If you snooze on Social Networking you might as well keep snoozing! I was not even the least bit interested in social networking except for my personal Facebook page….after reading this book it was very clear to me there is no other way to market a business but social networking! The book covers many scenarios and I know you will find WHY you and/or your business NEED to get started. The urgency to learn more and get started was so overwhelming while I was reading this book, all I wanted to do was to get started NOW as I do not want to be left behind! Social Networking Throughout Your Career: What’s All the Buzz About? Heidi Thorne Says: Ah, the power of Twitter to make connections! April M. Williams and I had connected on Twitter. I knew a little bit about her from her blog, website, and Twitter profile. Since we are both active networkers in the Chicagoland area, we decided to “tweetup” to get better acquainted. When I arrived at a local Starbucks, I found April already chatting with a gentleman that she obviously had met at some other time. Come to find out, it was a client of hers. Yes, these chance meetings at Starbucks coffee stores do happen. But I think it points to another fact: April is a networking pro who has learned how to establish and maintain valuable relationships. She even was able to leverage her network to find a new job within only a few short weeks after a massive corporate layoff. So writing a book about social networking is a natural fit for her. April’s book Social Networking Throughout Your Career is a quick and helpful introduction to the world of social media. I think it is especially suited for those folks who are barely on the on-ramp to these arenas. It discusses the pros and cons of the various networks such as LinkedIn, Twitter, YouTube, and Facebook in a non-overwhelming manner that should help those on the fringes want to make the leap online. What I particularly liked about the book, and true to its title, was that it emphasized how to use these networks “throughout your career.” Some networks and strategies are more appropriate to some life stages than others. Also unique to the book was the emphasis that one begin social networking for career purposes in high school. High school! That is a departure from the literature in this subject area which often does not address age issues. I think we do need to show teens how their online activities can enhance or detract from their future college and professional careers. One of my favorite quotes from the book is, “It is not who you know. It is who you know knows.” Building your social networking channel can help you tap into that second “who you know knows” tier of contacts. Sheri Bland says: I read this book knowing I needed to get on board with social networking for my professional life. WOW! I was able to read it in a weekend and found it an ‘easy” read, not technically over my head, and it categorizes the various types of social networking tools and directs how and when to use them. It made me see that this IS where the business world is, and how I can navigate the tools to the best advantage for my business and career. I like how April laid out the different tools, analyzing your career stage and goals-I was able to set up my own Linked In account after completing the book. I highly recommend this book to professionals who need to know more, who want “how to’s” on where to go with social networking and who desire to market and build their business and career.